Photo by Evrim Resources Corp.
A subsidiary of Chile-focused copper miner Antofagasta Plc. (LON:ANTO) signed an agreement with Canada’s Evrim Resources Corp. (TSX.V:EVM) to acquire a 70% interest in the latter’s Axe property, located in south-central British Columbia. 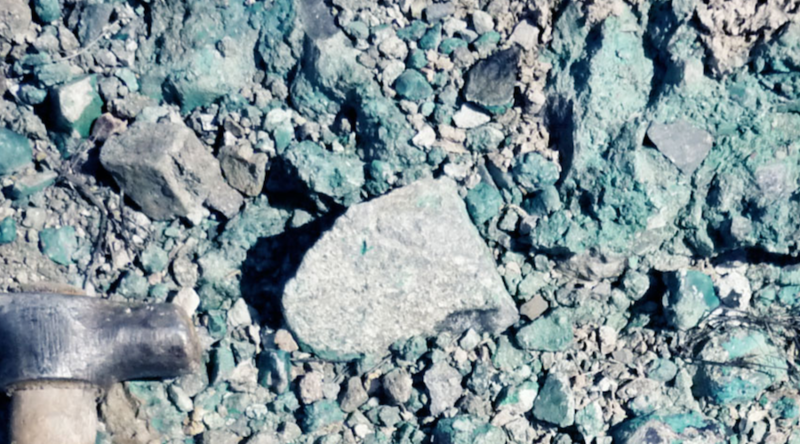 In a press release, the companies explained that Antofagasta can acquire a 70% interest in Axe by incurring $50 million in exploration expenditures, making cash payments of $800,000, and completing a National Instrument 43-101 compliant Preliminary Economic Analysis, over a ten year period. Axe is a 50-square-kilometre land package within the Intermontane Belt in the southern portion of the Quesnellia Terrane. This gold-copper porphyry belt, which extends from the Canada/US border to north of Kamloops, hosts Newgold’s New Afton Mine, Teck’s Highland Valley Mine and Copper Mountain’s namesake mine. The southern Quesnel trough is composed of Triassic Nicola Volcanic Belt rocks and associated Jurassic to Cretaceous intrusions. According to Evrim, the Axe project contains four known porphyry targets (West, Adit, Mid, and South) within a 5 kilometre by 3.5 kilometre hydrothermal footprint. The firm says that drilling by previous operators adjacent to the central cores of the West and South zones returned intersections such as 124.5 metres grading 0.35% copper and 0.22 grams per tonne gold in drill hole A07-08, including 10.5 metres grading 1.55% copper and 0.94 g/t gold at the West Zone. The Vancouver-based explorer also states that recent work on the 1516 zone defined an unexplored copper, gold, molybdenum, bismuth and tungsten in soil anomaly immediately east of the Adit and Mid zones over a 1,000 metre by 500 metre area, and is associated with a quartz-sericite-pyrite altered gossan and coincident chargeability and conductivity high. The 1516 zone only has four holes on its eastern edge that were drilled between 1970 and 1982. “Both Evrim and Antofagasta have completed an extensive data review with an approved $1 million drilling and exploration program in the spring of 2018,” Evrim's CEO Paddy Nicol said in the media statement. This agreement represents Evrim’s second such transaction with Antofagasta in British Columbia. A previous deal was signed last February and it allows the Chilean miner to acquire up to a 70% interest in the Ball Creek property, a large land package in the Golden Triangle that carries district scale exploration potential for gold-rich copper porphyry targets.